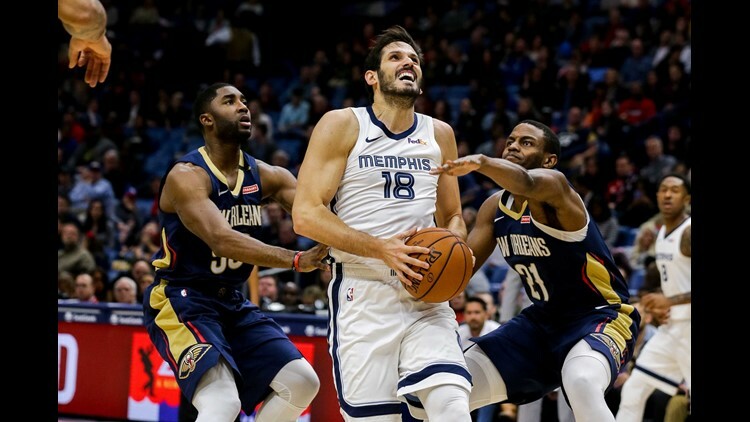 (Dec 7, 2018) Memphis Grizzlies forward Omri Casspi (18) drives to the basket against New Orleans Pelicans forward Darius Miller (21) in the first half at Smoothie King Center (Photo by Stephen Lew-USA TODAY Sports). It's the fourth loss in 14 home games for the New Orleans Pelicans, falling 107-103 to the Memphis Grizzlies. NEW ORLEANS (AP) - JaMychal Green scored 24 points in a reserve role, and the Memphis Grizzlies beat the New Orleans Pelicans 107-103 on Friday night. Memphis improved to 7-6 on the road. The Grizzlies, who led by a single point heading into the final period, improved to 11-2 when leading after three quarters. Conley, guarded primarily by Holiday, was held to nine points after scoring between 20 and 37 points in each of his last five games. Memphis entered the game allowing opponents to shoot 44.7 percent, which ranked 10th in the NBA. The Grizzlies allowed the Pelicans to shoot 45.2 percent (38 of 84). Forward Nikola Mirotic, New Orleans' third-leading scorer, returned from an illness that sidelined him for two games. Although he has started most of this season, he came off the bench against Memphis, playing 20 minutes and scoring only four points on 1-of-6 shooting. Solomon Hill scored a season-high 14 points, hitting four of six 3-point attempts. His previous season high for scoring was six points in three different games and he had not scored more than 13 points since April 4, 2017. Guard Tim Frazier sank a half-court heave as time expired in the third quarter, cutting Memphis' lead to 85-84. New Orleans outscored Memphis in the paint, 58-52. The Pelicans head to Detroit next to play the Pistons on Sunday.